The internet pretty much exploded last week at the news that Facebook had acquired messaging service WhatsApp for a massive $11 billion. Websites debated whether the app was really worth so much, what Facebook’s plans were, and what this meant for the future of both companies. Unfortunately, according to an article I was linked by my good friend and fellow blogger Rob Kelly, it may have become worse for WhatsApp, as least initially. Business Etc. reports that a number of rival instant messaging services saw a huge increase in downloads. While people are not explicitly leaving WhatsApp, it does suggest a dissatisfaction with it being owned by Facebook. But what problem would users have with Facebook’s acquisition? There does seem to be a general online dissatisfaction with Facebook, once the king of online interaction, and since one of the most popular social media sites in the world. Perhaps it’s the platform’s relative uncoolness with younger online users, many of whom, it’s been noted, prefer instant messaging apps such as WhatsApp. Or perhaps there’s a fear that, as with photo sharing app Instagram, Facebook will try to establish some form of monopoly over the service where you must have one in order to have the other. Honestly, WhatsApp will probably flourish under the wing of a company with the resources and experience of Facebook. But Facebook itself may suffer in the future. Perhaps these acquisitions are intended to proof the company against that. Once Facebook the site goes the way of Yahoo and Myspace, it will simply be used as a portal to the more profitable mobile apps. Today I decided to start working through the course material of Google’s Digital Analytics Fundamentals Course, which teaches people how the Google Analytics tools work, and how to use them effectively on a website, especially business websites. Although the official course happened last year, the course materials are freely available online. Although this is a little different to my usual blogs on here, I felt that it was important to do this course and discuss it here, to help me put what I have already learned about digital practices into a practical framework that will undoubtedly be useful in my professional life. The course consists of a number of instructional videos, some text, and a series of online quizzes. There are six modules, so far I have worked through three. I made extensive notes that I will try to clear up and summarise here to help get them into my memory! Changing Customer and user behaviour has changed how people approach measuring data. This is due to a number of major trends caused by online usage. – Information is available to everyone (who uses the internet). For example, when choosing which business to use, site to go to, or product to buy, users have all kinds of reviews and recommendations to help them decide. – Mobile devices mean people are connected 24/7. – Cloud Computing, which means there is almost unlimited computer power available, and almost unlimited data available. This means that customers and users need to be engaged differently. Rather than following a linear path (e.g. customer discovers your store, checks out your product, is engaged by you, buys a product, is retained as a future customer) the customers have much more control and can do these things in almost any order. Therefore, you need access to plenty of fast data to find out how they are engaging with your site. This section covered why data and analytics are necessary for a good business strategy, and how they should be implemented. There is plenty of quantitative data that is very easily available, for example, it is possible can track when users come to a website, what they do there, even where they have come from the get there. However, it is also important to back this up with qualitative data – the video lesson uses customer surveys as an example. this provides a more well rounded view. Data should drive continual improvement. However, the data needs to be treated in the right way to make it useful. – Measure the data – find out about your customers. – Report the findings to the right people in your organisations who need to make decisions based on it. – Analyse the data: trends, segmentation and benchmarking by making comparisons either internal data based on your site’s past data, or by the data of other websites and organisations within the same sector. – Have an expectation for your site, then figure out if you do or don’t meet it and why. Aggregated data will show overall user trends, but subsets of that data will show why those user patterns change. Google Analytics will show common segmentation of traffic data. The video lesson suggested a number of useful segmentation possibilities, such as data, device, and geography. I’m actually already quite familiar with this, as WordPress, Soundcloud and YouTube all show this kind of data, although not in so much depth. ‘Conversions’ are an important measurement, divided into micro and macro conversions. ‘Macro conversions’ are key actions on a website or app. For example, if you are an online retailer, a macro conversion would be a user buying a product. Meanwhile, a micro conversion is an action taken that might be a step towards a macro conversion, such as downloading a coupon. Attribution data works by assigning credits for a conversion. A Last Click Attribution means that all of the value produced by conversions goes to the click that generated the revenue. But it might be more beneficial to look at all of the marketing that led up to the click. A user may interact with the website many times before the macro conversion, which shows which role each micro-conversion channel plays in the macro-conversion. An alternate is First Click Attribution would shows which channel first brings users to the site. Or you could assign a percentage of the revenue to each assisting channel. Overall this shows which channels are used and how, as well as how they work together. Then you can allocate marketing budget and resources to the right places. When creating a plan for using Google Analytics, it should always be changing. There are a number of elements. – Start with a business objective, which states what you want to achieve. – Have strategy and tactics. For example – if a strategy is to sell a product, a tactic is to have an online store, advertising etc. The video lesson noted that you should consider whether the site you have to capable of tracking the KPIs you want to have data on. Again, this is something I’m familiar with, for example, through YouTube I am able to track demographics of my viewers, including age and gender, which might be useful in building an audience. I cannot do this through WordPress, if I wanted to use a similar strategy on this blog. ‘Dimensions’ describe characteristics of your users and their actions. ‘Metrics’ are the quantitative data of those dimensions. The video lesson went into detail about a number of types of dimensions and metrics. Most of this I understood quite well since, as I mentioned before, I’ve already dealt with analytics through YouTube and SoundCloud. However the tools available are clearly much more in depth than the ones available on those sites, with more segmentation options. The next three modules deal with how Google Analytics measures data in much more detail. I’m looking forward to doing them and writing about what I’ve learned. I feel that while much of the information in the first three modules was quite obvious to me, the focus on analytics for business put it into a new and interesting context. A few years ago during my undergraduate degree (and it’s a little depressing that I can call that a few years ago) I got to do quite a lot of work on the history of recorded music. The beginning of the recording industry is fascinating for a whole lot of reasons, not least because of the trips that fledgling record companies sent their employees on in search of new music. Sound engineers such as Fred Gaisberg were sent out all over the world from the fledgling Gramophone Company to find new genres to record – the idea was to bring back music which could be sold to ethnic minorities within the United States. Sometimes the recorded music wasn’t very good as the engineers would have to try and find out who the best local musicians were, and if they couldn’t they would just take whoever they could get! 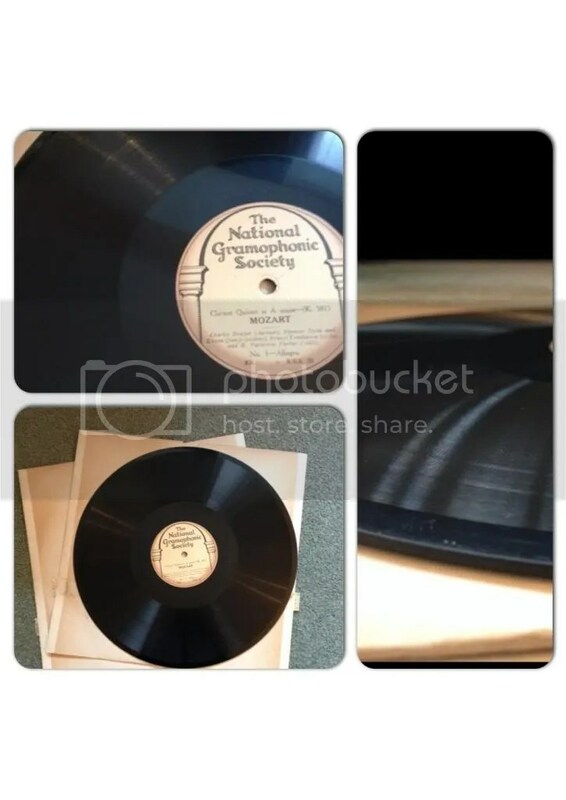 Some of those preserved shellac 78s – Mozart’s Clarinet Concerto in A – obviously not a disappearing piece of music though this is an early UK commercial recording – from around 1923? I’m too scared to even play these most of the time, they’re irreplaceable. Which is a shame, as the second violinist was my great grandfather. This can and does create niche audiences and enthusiasts from all parts of the world for music from other cultures. I had lessons in traditional tabla while at University, and I’ve performed both in the straight up traditional style and in more fusion-type pieces. I didn’t learn this online, but it’s clear that plenty of people do – many teachers offer skype lessons which keep musical styles alive in a world that far from being ‘homogenised’, sometimes seems more diverse than ever. 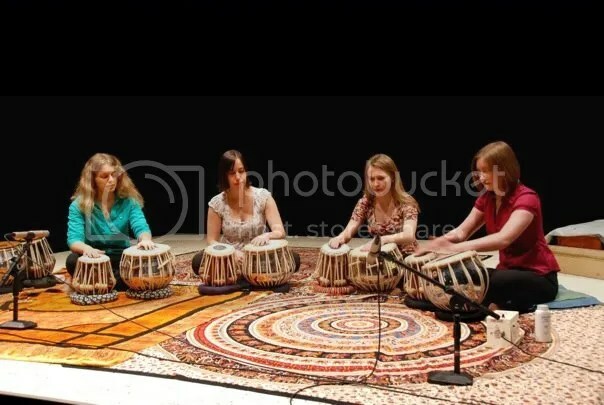 Playing tabla with some of my friends while at university. I haven’t written much on here about my dissertation work on mobile film, mainly because I was too busy writing it! (Although I did link a vlog on the topic here, and there are more on my YouTube channel.) However, as I finally handed it in three weeks ago today, I decided it was time I shared a few things about it on here. After going through several topics, I found myself writing about the role of mobile video in social media, particularly looking at social media apps such as Vine and Instagram video. I was particularly interested in Digital Identity – how people present their public persona online, and whether using video affected that. There has been plenty of literature on how modern mobile phone cameras have opened up filming to the general population, to the point where creating films has become a part of many people’s daily lives. However these apps have opened up sharing to the bigger population. People have been uploading mobile phone videos to the Internet for pretty much as long as there has been mobile video, and especially since the creation of YouTube in 2005. But doing this required getting the video off the phone, possibly editing it or changing file format, then uploading it… it was a much more complicated process that undoubtedly put a lot of people off. Now, you can record with an app which puts the video online and shared it to other social media platforms almost immediately, anywhere with WiFi or a 3G/4G connection. Knowing this, I decided to try to find out exactly why people were sharing these videos. What was the content? Who were the videos aimed at? What was did they think was the purpose of sharing these videos, especially since they were being shared to quite open platforms? Finding out involved doing a mix of studies, most importantly an online survey asking these kind of questions, but also a case study using the videos made for the #NextGenHello crowdsourced film, which I’ve written about previously. As these apps are so new, it was hard to reach out to the right people who were using them. But I did manage to come up with some conclusions. I had looked at vlogging on other channels as part of my literature, as it’s really entered the global consciousness as a ‘thing’ people do, even as a career. I thought there might be connections between the way people vlog on longer videos – to gain followers, and mobile apps, and there definitely is for a small minority, particularly using Vine to create clever short films. Yet the majority of the people I got info from weren’t interested in that at all. They mostly made videos to share through social media to a small network of friends and family, even if the videos were open and public. Videos were being used as a form of communication to a small number of people, as well as adding to their Digital Identity (usually in a positive way; a way that made them look good online in other words!) Even the #NextGenHello videos which were made for a wider audience featured common themes of people’s lives, hobbies and families. In addition, many of the videos creative in their shots and edits, even within the short time span the app gives you. 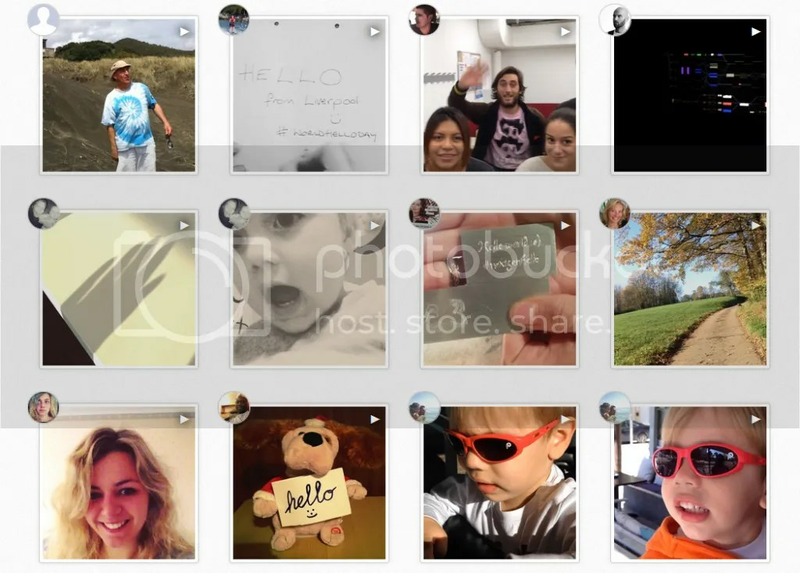 A selection of thumbnails from the Instagram videos found under the #NextGenHello hashtag. Screengrabbed from gramfeed.com. Many people didn’t seem to consider this in any great detail – they weren’t deliberately trying to create a particular online identity through their videos. It seems to be something we do without thinking, ditto the creative element. Mobile video has crept into social media and become a massive part of it almost organically, part of the process of evolution within online spaces.